The Virtual Sink: My Jalapenos Are Growing. Finally. I have probably joked about my brown thumb on this blog every year for the past three years. My lack of gardening skills were never so evident as they were this past Summer where, due mainly to drought-like conditions, I managed to kill off several flowers and two large evergreen bushes. My jalapeno plant hung in there like a champ, though. Even though it flowered several times over the Summer, it never bore any fruit until just recently. 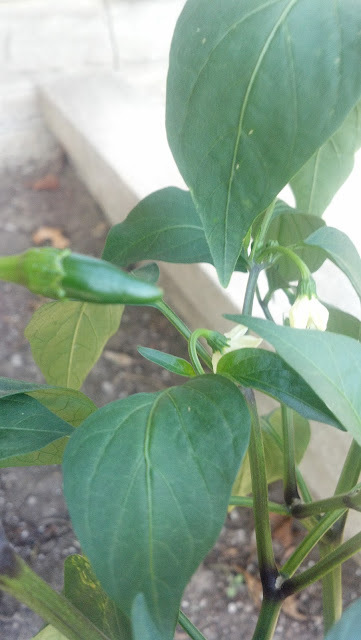 We had what seemed to be an incredibly hot Summer, and, I have learned that in high heat, jalapeno blossoms tend to drop off at temperatures over 90 degrees before pollination can occur. And, of course, without pollination, there's no fruit. So, now that the heat wave is decidedly over, my jalapeno plant has already sprouted at least 5 little fruit buds. Now, the trick will be to judge when to pick them. Mature jalapenos are usually 2 to 3 1/2 inches long and exhibit lines or small cracks on the shoulder. I'm hoping I end up having enough to make a decent chili.